SEOUL, Aug. 8 (Yonhap) -- After finishing the 2013 action thriller "The Suspect," filmmaker Won Shin-yun wanted to make a movie with a profound subject. And what gripped his mind was "A Murderer's Guide to Memorization," then a best-selling novel by Kim Young-ha about an aged former serial killer with Alzheimer's disease who struggles with his increasingly fading memory. "It was a novel with suspense, humor and depth. Rather it was strange that this novel was not made into a film. I really wanted to cinematize it," Won said during a news conference for "Memoir of a Murderer," his new crime thriller based on the novel at a Seoul theater on Tuesday. Questioned how the movie is different from the original novel, the director said he added some cinematic imagination to the backbone of the original stories so all audiences, whether they have already read the book or not, can enjoy the movie. Actor Seol Kyung-gu plays the role of the main character Byeong-su, a "retired" serial murderer with Alzheimer's who comes across a man named Tae-ju that his instinct says is a murderer and sets up a plan to "remove" him from Earth. For the character, the 49-year-old said he chose to lose weight rather than use a special makeup to look naturally older. "My character is in his 70s in the original novel. I put on a special makeup for 'My Dictator' (2014) but felt uncomfortable because it wasn't my skin. After having many discussions with the director about this, I told him that I'll choose to get older," he said, adding that he skipped rope two hours each morning and refrained from carbohydrates to lose weight. "I don't know exactly how much weight I lost because I didn't weigh myself after dropping to 68 kilograms," he said. "It was harder to maintain the reduced weight during shooting." Actor Kim Nam-gil, who plays opposite to Seol, said he gained 14 kg for his poker-faced policeman character Tae-ju, whom Byeong-su thinks is a murderer. "I gained weight upon the request from the director that he wanted me to be fat and cold-heartedly poker-faced," Kim said, adding that he was inspired by Heath Ledger's performance as the Joker, the main antagonist in the 2008 Hollywood superhero film "The Dark Knight." Seol Hyun, a member of K-pop girl group AOA, takes the role of Byeong-su's daughter Eun-hee, while Oh Dal-su is Byeong-man, Byeong-su's longtime friend and chief constable who tries to hunt down a serial murderer connected to incidents that happened 17 years ago. 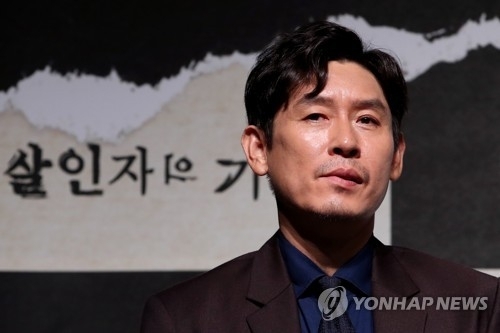 "Memoir of a Murderer" is to open in local theaters in September.